Nestling in the south-eastern region of South America lies Uruguay, a country sometimes unfairly overlooked because of the neighbouring tourist hubs of Brazil and Argentina. Often regarded as ‘the Switzerland of South America’, Uruguay not only boasts an awe-inspiring landscape but also a well-developed economy and the most liberal laws in Latin America. The capital city, Montevideo is a must see. It is a vibrant blend of neoclassical buildings, theatres, shopping centres as well as a downtown business district. One of the city's most notable sights is the Casa Rivera. It is the former home of Uruguay’s first president but is now part of the National History Museum and houses an impressive collection of paintings, furniture and artefacts dating back to the nation’s indigenous roots. Aspiring playwrights should make the pilgrimage to the impressive Teatro Solis, the country’s finest and oldest performance space which was first opened in 1856. Montevideo's gastronomic centre is the Mercado del Puerto. Once an old port building, it has since been transformed into a magnificent, bustling food market filled with talented street musicians and artists. 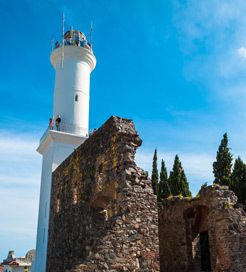 Photographers will be in their element with a visit to Colonia del Sacramento, situated around 180 kilometres west of the capital. As a UNESCO World Heritage Site listed town, it boasts incredibly picturesque surroundings, namely long cobbled streets, a gorgeous riverside and fascinating 17th Century convent ruins. As you would expect, the gaucho culture is ever-present in Uruguay and is passionately celebrated during the Fiesta de la Patria Gaucha in Tacuarembo during March. The festival involves an exciting display of rodeos, parades and folk music performances. One of the country’s most iconic sights is ‘La Mana’ (The Hand) on Punta del Este’s Brava beach. It is an enormous sculpture of fingertips protruding from the sand, whilst the beach itself is an ideal place to drink in wonderful sunsets and relax in luxury seafront homes. You can sail from Buenos Aires, Argentina to Uruguay with frequent crossings to Colonia del Sacramento and slightly less frequent crossings to Montevideo. For more information, please visit our Ferries from Argentina to Uruguay page.